Little Office of the Blessed Virgin Mary: Behold Your Mother By Matthew Russell S.J. Part 2. 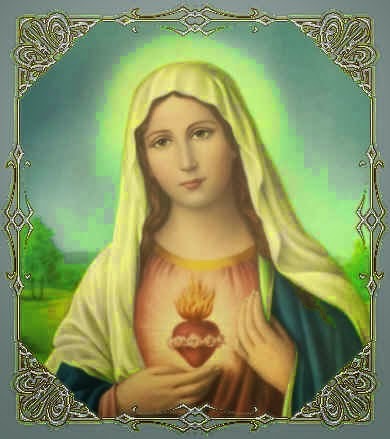 The Immaculate Heart of Mary. Behold Your Mother By Matthew Russell S.J. Part 2. The Immaculate Heart of Mary. "Holiness befits Thy house, O Lord" These last words of the ninety-second psalm, which is repeated in the Divine Office almost every day of the year, refer in their primary meaning to the temple of God in Jerusalem ; but in a higher mystic sense they are applicable to the Blessed Virgin Mary. For Mary is pre-eminently the house of God. We are all of us indeed God's temples; but in a special and transcendent sense our Blessed Lady is the tabernacle of God with man, the shrine wherein God's glory dwelt. In the Incarnation, the Divinity wedded itself to our humanity, and this union was accomplished in the womb of Mary Immaculate. To no closer relations with the Infinite Creator could any creature possibly be raised than this relationship of Mother to the Man God. Not by a mere figure or metaphor, not by adoption or any external title, but in literal truth and reality, Mary is Mother of the Incarnate God of heaven and earth, for whom, according to His own word, a body was fitted— corpus aptasti mihi —out of her substance, and who drew from her veins that blood which was to wash away the sins of the whole world. But her own soul, more perfectly than all others, was the first to be bathed in that cleansing tide. As fountains, mindful of their source, will strive to spring upward to the height from which they have come, even thus (says the great French bishop Bossuet) the river of the Precious Blood has sent its divine efficacy back to its source, the Immaculate Heart of Mary. The Immaculate Conception, therefore, is no limitation set to the conquests of the Precious Blood, but it is its earliest and completest and most glorious triumph. It is no encroachment on the empire bought by the blood of the Lamb that, by promise and acceptance, was slain from the beginning of the world. It is no exception to the universality of Christ's '' plenteous redemption '' ; it is but the first and fairest and richest of the fruits of that redemption. For the mystery of the Incarnation almost began to be virtually accomplished at the moment of the Immaculate Conception—the first instant that a human heart was beating which from its earliest throb was unutterably dear to the Son of God as the Heart of His Mother. From its very first throb. Never for one instant did the serpent triumph over this Second Eve, this true Mother of all the living- Never for one instant was she alien to God and enslaved to sin. God could not suffer that even for a single instant, even for the swiftest lightning flash of time. His all-pure eyes should be offended with the presence of sin of any kind, or any form, in that soul for which He had waited so long, the object of His divine predilection from eternity. 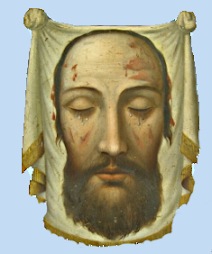 No, it beseemed the dignity of such a Son and of such a Mother that from the first instant of her being, the soul of the Blessed Virgin should be enriched and beautified with all graces, and preserved from the original stain by the special privilege of God's omnipotent mercy, through the merits of her Divine Son, Jesus Christ our Lord. "Fear not, Esther: this law of death is not for thee but for all others" (Esther xv. 13). The Heart of the Immaculate Mother is, of course, of all hearts the most like to the Heart of her Divine Son, to whom even we at His own bidding pray: "Jesus, meek and humble of heart, make my heart like to Thine/' Mary herself could have prayed that prayer during her mortal life. Nay, she did pray it, and her prayer was granted. At each successive moment of her years on earth the Heart of Mary grew more and more like to the Heart of Jesus. Out of all the fallen race of man she alone—we have said this before, but it is a delight to say it over and over— she alone, from the first throb of her heart, gave full heed to that entreaty of her Creator, " Child, give Me thy heart " (Prov. xxiii. 26). She alone, from the first throb of her heart, obeyed perfectly that first and greatest commandment, "Thou shalt love the Lord thy God with thy whole heart" She gave her whole heart to God, she loved Him with her whole heart. She never for one moment tarnished ever so slightly the sheen of heaven on her soul; and this perfect purity of heart enabled God to throw upon this speculum justitiæ, this beautiful and unspotted mirror, all the brightness of His divine grace and sanctity, as far as creature could reflect them, so that His eye might at all times, and ere time began, rest with complacency upon the Heart of Mary, before and during and after her mortal life on earth, and now this moment in the immortal life of heaven, and on and on for ever. The first feeling that the contemplation of this mystery ought to excite in our hearts is an unselfish joy. We ought to rejoice with God that there is one perfect trophy of His redeeming grace ; one utter and absolute triumph over sin and hell; one human soul, in which the Enemy of God may never for one moment have any part so as to be able to boast that the Mother of Our Lord, the Daughter of the Eternal Father, the Spouse of the Holy Ghost, had ever been in any sense his slave; that there should be one soul at least on which the eye of God, for whom there is no past or future, might rest for ever with delight as perfectly pure and spotless. But let us think of the Most Pure Heart of Mary, not now as the joy and glory of her Maker and Redeemer, but rather as the joy and glory of our Blessed Mother herself. And for Mary herself. Queen of Heaven and Mother of God, must not her joy of joys and her glory of glories be this perfect sinlessness—the possession, the secure and inalienable and everlasting possession, of this priceless treasure of a pure heart—purer than Alpine snows, purer than the stars, purer than the light of day ? May we not dare to say that Mary's share of the happiness of heaven— and what a share that must be !—is derived less from the glorious crown that sparkles on her brow than from the pure heart that beats within her breast ? All others that have gone up from this earth to fill the vacant thrones of heaven have been at some time, in some degree, under the ban of God's displeasure ; to her alone has He at all times said : " Thou art all fair, O my beloved, and spot there is not in thee !" We ourselves, sinners though we be, can perceive dimly from afar how rapturous must be the glory and the ecstasy of this absolute freedom from sin. To have sinned even once is for ever to have sinned. God Himself in His almighty mercy can not undo that To have been for even the briefest term under the blight of sin is for ever to have been in time past under that deadly blight. God can forgive but He can not forget. Blessed be His mercy and His Power, that He has preserved one from the sad need of forgiveness— one on whom for all eternity He shall be able to look without being (in our human language) reminded of bygone miseries, from which only His mercy could have snatched her ! To be thus reminded of His mercies serves indeed to endear us poor sinners to Him; but a greater stretch of His mercy saved her who was to be the Mother of His Son from being ever plunged into that horrible sea of ruin wherein all other human creatures are well-nigh lost. For this greater mercy shown to the Blessed Virgin Mary, and for all the other special and singular graces reserved for her, let our souls also "magnify the Lord" and let our spirits rejoice with hers in God, her Saviour. With this joy, however, is there not mingled a certain lurking jealousy, a selfish fear and sadness, as if all these great things which the Almighty has done for His Handmaid raised her higher and higher above us and removed her farther out of our sight ? How can she, the pure and sinless Virgin, look with love and interest on us, who are so sinful ? But she can. The tenderest and most compassionate Heart of all is His who is immaculate and impeccable, not by grace only but by nature ; and next to the Heart of Jesus the kindest and tenderest and most merciful of hearts is the Immaculate Heart of Mary. In one of the exquisitely beautiful "Discourses to Mixed Congregations,'' which was John Henry Newman's first publication after his reception into the Church, these words occur : " It is the boast of the Catholic religion that it has the gift of making the young heart chaste ; and why is this," he asks, "but because she gives us Jesus for our food and Mary for our nursing Mother ? " Not by the young heart alone are these purifying influences needed. Hearts may remain youthful to the end in many things, good as well as evil; and hearts both young and old require to be screened against the glare of temptation and against the bewitchment of vanity—screened by the very thought of the Blessed Virgin Mary, by her prayers and patronage, and by the holy moonlight of her smile. Yes, the mere thought of Mary's Immaculate Heart helps her poor children down below on earth to keep their hearts pure amidst the temptations and allurements of this life. Abiding habitually in her sweet and gentle presence, we learn of her to be pure of heart, as we learn of her Divine Son to be meek and humble of heart. There are, thank God, many even on earth whose presence thus purifies the very air they breathe and makes vile, earthly thoughts impossible while they are near. So in a transcendent degree with the Mother of Purity, Her of the Immaculate Heart, " the mother of fair love, of fear, of knowledge and of holy hope." There was a good French boy many years ago, Albert de Dainville, who received as a birthday present a handsomely illustrated volume. His mother and he, turning over the pages, found that many of the pictures were unfit for Christian eyes, and they determined to destroy the book, gorgeous as was its exterior. That night after they had retired to their rooms, the lady heard her son calling her to his bedside. "Those horrid pictures are haunting me still, mother. Sit here beside me and let me hold you by the hand till I fall asleep. " Every careful and pious mother, Like this good French lady, resembles in her measure the Mother who was bequeathed to us all from the Cross; and so this simple incident has its counterpart in the life of many a child of Mary ; and we are all of us—young and old, men and women, married and single—we are all of us children of Mary. Just in the same manner when assailed by temptation—evil thoughts or evil memories, or evil desires or dangerous company, or any other of the perils of life—we must fly to the Most Pure Heart of Mary, we must summon our Blessed Mother to our aid, imploring her to stay with us and not to let us part from her till we are safe, till all danger is past; and that will not be till life itself is past, till Mary has watched over us to the end, and we (with the names of Jesus and Mary and Joseph on our lips) have fallen asleep in peace to wake up with joy at the feet of our Immaculate Mother in heaven.